For some reason in high school, I thought that sewing would be more spectacular than something as practical as typing, so I signed up. The most important thing that I learned that year had nothing to do with needles and thread. I learned that Mrs. Mitchell did not like anyone to sit on the tables, under any circumstance. "Get your buns off the table," is what I gleaned from my first year of sewing instructions. Years later, in college, having not sewn a single blessed thing since high school (but for the most part keeping my buns off of tables), my little sister signed up for sewing 101. Somehow, she got the notion that I should sign up for sewing too. I had zero interest, since my high school sewing class was anything but riveting. She told me that college sewing would be Fun! and that sewing is a very Practical! and Useful! Skill, but I wasn't convinced. And then she dropped the bomb: "If you don't learn how to sew, then your kids will have to wear plastic costumes for Halloween." I didn't have any kids. I wasn't sure if or when I would have kids, but I knew one thing for certain. One day, if and when I did have kids, I sure as heck didn't want them wandering around town in plastic costumes one night a year. It was a real possibility. Plastic costumes were all that were available when I was growing up; if your mother didn't make your costume or you didn't forage for one through the family closets, then you were left with a slick and flimsy grocery store costume, much like a disposable party tablecloth. Had I known then that by the time I finally had children that Disney was going to be making Practical, Useful and Gorgeous costumes, AND selling them at Target for ridiculously affordable prices, I never would have signed up for that sewing class. And by the way, sewing 101 was not a success. My sister and I, anxious for A grades, did extra credit, completed all our sewing projects neatly (kind of) and on time. We even went to our instructor's house for an optional project, just for brownie points. Imagine our dismay when we both-BOTH of us got C pluses in sewing! Mrs. Rosen claimed that we did a terrible job on our final, and deep down I knew she was right. We had to sew a puny shirt with buttons and zipper that would only fit on a Ken Barbie. Criminy-I wasn't trying to sew Barbie clothes-just Halloween costumes! C plus! Grumble, grumble! Yes, my undergrad GPA suffered, but it turned out all right in the end. My two little charges have never ever had to wear a plastic tablecloth costume. C-plus crooked seams and lopsided sleeves, yes. But plastic, no. Phew. Happy Halloween! Keep safe tonight everybody! My Halloween hot chocolate is more of an "idea" than a recipe. Toss a couple of pieces of Halloween candy in the bottom of your mug to make an extra special cup of hot chocolate.My favorites are Reese's peanut butter cups, Butterfingers, Whoppers or Hershey Bars. A bit of whipped cream and orange and black sprinkles make it extra pretty. See you after the weekend ! I remember those plastic tablecloth costumes, well. Thankfully I never had to wear one (although I did wear plenty hand me down costumes) because all the kids who had to wear them, would wear them to school and less than an hour into school, before the big parade even started someone would raise their hand and cry, "Teacher my costume ripped." I always thought it was so odd that someone would wear a plastic costume. But if Disney didn't make the practical and reasonable costumes, my little charges would be the ones crying out, "Teacher my costume ripped."! I wish I could sew like you do. Maybe one day I'll give it a try, but I'm getting on in years. (Insert smiley face.) Love the hot chocolate ideas. Annabelle will love it too, she loves to do this same thing with plain milk and M&M's. I like you idea better, and I think she will too. The costumes and the kids look amazing and adorable! Okay I am jealous! I would wear that Belle costume in the drop of a hat! (ask anyone in my fam!) Your sewing has paid off! Sadly this is something that I know I will turn to my mom and my little sister for help on! (I don't want my kids wearing plastic either!) I am trying to ge my hubby to dress up tomorrow! We'll see if it happens! My sisters and I may do an 80s theme (80's, 70's, 50's etc are always a fall back for costumes) big hair, flourescent clothes, dangle earrings and we are set! Have a wonderful Halloween! We will be haunting the Washington area it sounds like and then head to my parents . . . (by SCHS) so who knows . . . you may see our scray crew yet! I loved your story here this morning Erin! 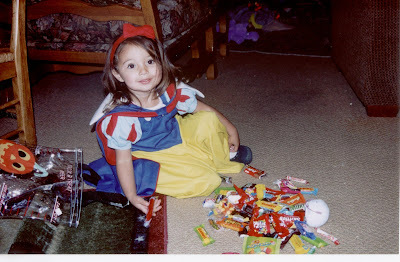 I always had homemade costumes, no plastic ones for me, although I would have loved to have one! Kids eh! You can never please em! Your kids are adorable as are their costumes, and as for that hot chocolate . . . I'll be right over, have one ready and waiting!!! Great story. Judging by those costumes, you should have gotten a higher grade. Your kids are so adorable too. Nice work! BTW--it is actually pretty rainy and cool here tonight so I want your hot chocolate right now! Look at all of the spectacular (spooktacular? ), non-plastic costumes that you've sewn over the years! I like your sister's rationale for why sewing is important. And just think, when you're kiddies are past the trick-or-treating years, you'll be able to dress up store-bought pillows with fringe and tassels!!! (the reason that I want to learn to sew). So I guess the C+ was worth it in the end. It looks like the concert was a blast! Happy Halloween! Cute story and way cute kids. Liked getting to see them over the years. And loved the concert pictures. Obi Wan is so serious and loves Belle's little grin. Yall have fun and be careful tonight. Oh man, I am making this tomorrow with our leftover candy (assuming there is some!). I have been dreaming of hot chocolate lately, and this is just perfect. Your costumes are beautiful! I see no mistakes, they look perfect from here. I am not much of a seamstress, but I did make a cape one year that I was rather proud of. Your costumes turned of beautifully! I so wish I could sew! That hot cocoa looks tasty! YUM! Your writing has such a beautiful voice! Adorable kids, great costumes, YUMMY hot chocolate...what more could I ask for on a Friday am? :) HAPPY HALLOWEEN!! Just stopping by with a treat not a trick. I love your story and the pictures of your children in their costumes. You have a beautiful family Erin. I could look at pictures of your children all day. They are adorable! Especially love the Little Bo Peep costume. Love this idea for hot chocolate. I think I'll make some tonight. Is it just me or does every little boy wanna be a jedi this year? This year my godsons are a jedi knight and yoda. Cracks me up b/c "yoda" is 11 months old and those green ears are hilarious on him! Happy Halloween! I think that you might just have the most beautiful children ever! The are so beautiful and how amazing that you have always made their costumes, no wonder all their costumes look so good. You seriously underestimate your talent. That is funny that your sister talked you into talking the sewing class. I would have definitely flunked out of college if sewing were required. I do a minty hot chocolate with peppermint patties, but haven't tried other candies. Can't wait to try it. And I'm never energetic enough to make it so cute with the sprinkles and whipped cream. You've inspired me! Fun story and great costumes! You could've done what I did- commission your mom to make your kids' costumes. :) Happy Halloween! Your kids' costumes are adorable! I love your idea of adding halloween candy to hot chocolate. Have a fun holiday! Happy Halloween11 I think you did a great job putting your kids costumes together, despite not performing so well in sewing 101. Have a wonderful weekend. You've got some very adorable little trick or treaters there. I love all the little ghoulies and ghosties. Your costumes are spectacular! I love Belle, especially, because I think all girls are pretty princesses at heart. I'm afraid that my costume post will have to wait until tomorrow, because I simply can't bear to get the boys into their costumes now and start the fun & games this early! Adorable children, darling costumes, and delicious hot chocolate - can't ask for much more than that! Looks better than C+ to me! Love the hot chocolate idea, too! I fully confess to the faulty logic I used to make you take sewing, but I promise I believed it. What a funny class it was and what a terrible grade--my worse college grade, too! Your costumes are amazing. The kids look so cute. I really like the older pictures blast from the past. I miss that little Snow White and Mr. West too. Happy Halloween! They look so cute. I regret not taking any sewing lessons when in school,i'm pathetic at stitching. You have charming kids,the costumes look like a work of an accomplished tailor:). those costumes are AMAZING!! I especially love the Little Bo Peep type costume! so sweet! I am so impressed- I always had homemade costumes growing up and I hope I'll be able to do the same for my little girl- too bad I can't sew but thank God my aunt and mom can! I am good at scrounging around for "found" costumes from odds and ends around the house! haha! Happy Halloween! The costumes look great! We had some homemade costumes, but I did wear my share of the plastic ones as well. =) I enjoy sewing, but I just can't find the time to do it right now. So we have store-bought princess costumes. I think your sewing is fantastic! Those costumes look better than some of my clothes! Ha! Hope you have fun tonight. Ooops!! Forgot to mention your handy sewing!! The costumes look terrific!! My two children never wore a packaged Halloween outfits. Sewing intrigued me, how the puzzle pieces of fabric came together and to this day I'm still at it. Oh Prudy, what a great post. I loved reading it. I love looking at the photos of your adorable children. It makes me want to go hug my kiddies and beg them not to grow up!! It goes so fast!! I remember the plastic costumes...I remember being Wonder Woman when I was 4 years old! Your Belle and Obi Wan are precious! You did a GREAT job with their costumes!! OH and btw...the hot chocolate sounds perfect! I love this post. The kids are so cute, especially when they were SO LITTLE! Don't you wish they could stay that way? It made me sad,too. Look how that sewing class paid off. Your costumes are great. Why one earth was the final for a Barbie size shirt? I tend to take things very literally, so maybe it was actually bigger. Anyway, how unfair. I would have paid good money to see you and Heidi in sewing class together. I wish I could have taken the class too. The kids Halloween Violin performance looked adorable. And, West is the most serious Jedi-Master I have ever seen. Happy Halloween Prudy. We miss you and I can't wait to see you on Tuesday! I have a very different version of hot chocolate, that fits perfectly with Halloween... It tastes just like it sounds. Liquid Candy Bar Hot Chocolate! Oh it is spectacular! It really was a tiny shirt, not quite Barbie, but not much bigger. Maybe beanie baby size. I'm still mad about it after all these years! Oh, and you have to hear Roy say "Get your Buns off the table" like Mrs. Mitchell. "Get your buns off the table!" LOL! Oh yummy, these look delicious! The kids are the cutiest!!! And aren't you glad you went to 101 sweeing?! That's a funny story! Loved all the costumes! The second picture is just too adorable! The speaking cupcakes are really cute too! Thank goodness that we no longer have to purchase those old plastic costumes... I am definitely "sewing challenged", and love that my kids are not stuck in those gross plastic things! Your kids must love that you make their costumes each year. That makes for a special memory for you all to share. Love your hot chocolate idea! I'm going to have to try that sometime! Great post! Love the sewing class story. You have got cute kids. 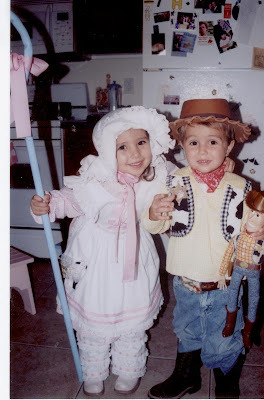 I love the costumes over the years, and I'm with you on the plastic halloween costumes. Yours are darling. What a fun concert with all the kids dressed up. I love the Obi-Wan costume. Last year we did a Star Wars theme. I was Leah, my hubby was Han Solo, 2 year old Luke, and baby Yoda. Great fun. Your little boy looks the part too. I bet he was just tickled to have a costume that looks just like the character. Way to go! The hot chocolate looks delicious. Your kids are so cute...I love that they play the violin. I know exactly what you mean about the good idea not working out. I got the briliant idea that I would sew felt stockings froma kit for Ben and I and then I realized really fast that...I hate sewing. So now I'm trying to get rid of my stocking kit. It was $16. I'm not going to just let it sit in my office. You're talking to the queen of cheap! I'm going to wind up sewing that dumb thing. I know it. Your kids and their smiles are beautiful! What a nice Mommy you are!! Now did you say a little whip cream in that cup??? I want to come to your house! I HAVE to comment because, thanks to you, I had a WONDERFUL Halloween! You would be SO proud of me! I made your Friday's Sweet & Spicy chicken, put it in tacos, with your homemade Guacamole recipe, and had you Carmel Apple wedges for dessert! I also made a pretty perfect batch of Rice Krispy Treats that reminded me of you! You ALWAYS make the most delicious batch to take to Pine Valley! Our Halloween Smorgesbord (spelling?) was PREFECT! Thanks again! your costumes are charming as usual, and from here i can't see a single sloppy seam or crooked sleeve! my sewing projects have all been disastrous, but hope springs eternal! i was thrilled last night when some friends showed up at our open house with "prudence pennywise's donuts!" they were delish and i was glad that they have found you. so besides using the chili recipe you gave me years ago, we had your donuts last night too. it was almost as good as having you there. but not quite. by the way, how adorable to have the kids' concert in their costumes? cute idea. You are joking...seriously Erin, I am so impressed with the costumes that you have made your kids! They are fabulous! You do realize that sewing clothes is a million times harder than sewing a quilt? Am rearranging Christmas plans for a baby blessing in LA...will let you know the dates I am in STG very soon! I love all of the costumes! You have the cutest kids! Prudy, if you're going to NY this week, the weather promises to be warmer. Like 50 or so. Just so you know, you won't be stuck in snow like I was last week! That's the 1st hot chocolat I've seen that I don't want to disturb, golly darn perty. Great idea Prudy! And that IS about the prettiest cup of cocoa I've ever seen. Sorry about your grade -if you got a C then I fear greatly what I would have received!! And all for a Ken and Barbie shirt? Who has hands tiny enough for such tedious work?? Oh my goodness...look at all these beautiful photos! I have always been that 'one' person whose costume invites such remarks 'really?? and you are a designer?' - meaning, I am soooo lame and not innovative at all when it comes to costume! Those costumes are really adorable. Well done Prudence! they are darling! I took "clothing construction" in high school and learned that while I was all about making some fast, that was not the point of the class. I got in much trouble for my lack of prewashing, ironing, and unfinished seams-- but, I too, can make perfectly acceptable Halloween costumes!